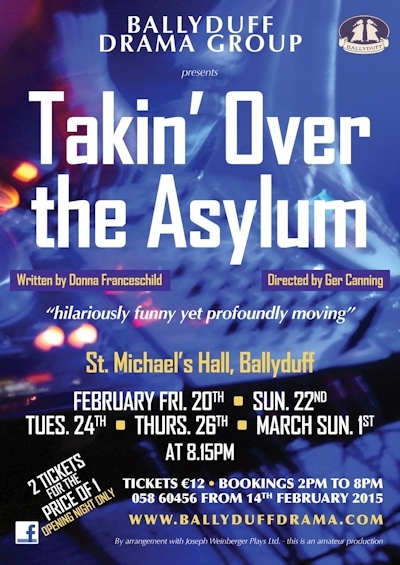 Ballyduff Drama Group announces its 2015 Festival Circuit Production - 'Takin' Over the Asylum' by Donna Franceschild. A hilarious and profoundly moving adaptation for the stage of Donna Franceschild's cult 90's BBC TV series. We're in One Flew Over the Cuckoo's Nest Territory but based in a Glasgow Psychiatric hospital - where Eddie McKenna, Soul Survivor and double glazing salesman arrives to re launch a defunct hospital radio station but turns more than the ramshackle station upside down. As the patient's battle with perception and prejudice as much as illness, Eddie armed only with his soul music record collection realises the main obstacle in his path is not anyone's bipolar disorder, OCD or schizophrenia, but the psychopathic control of the institution. His battle with the system transforms not only their lives but his own as well. More touchingly, the play illustrates the fragility of the human psyche but behind Franceschild's brash, confrontational jokes is a plea for understanding the damage that can be caused by circumstance.